Our tailored outdoor kitchens are designed to suit your lifestyle needs and improve the function and value of your home. 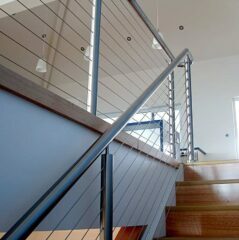 We fabricate a wide range of balustrades and handrails for both domestic and commercial use, all to safety guidelines. We have a flawless reputation for producing high quality stainless steel Benchtops, Benches, Tables, Table Frames and Trolleys. We have designed and fabricated a range of mobile and fixed bars, big and small, for both domestic and commercial use. We can basically fabricate ANYTHING from stainless steel… and we LOVE a challenge! Ackland Stainless Steel are a well respected stainless steel fabrication firm servicing commercial and domestic clients. We are located in Thebarton, just outside of the Adelaide CBD. Since it was first established in 2007, the business has grown considerably in stature due to our team’s very keen attention to detail and outstanding customer service. 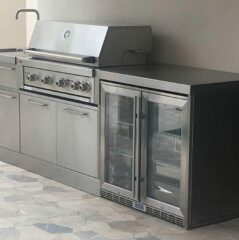 From simple designs, such as adding stainless steel shelves to an existing BBQ, or designing a complete outdoor kitchen incorporating stainless steel sinks, gas hobs, Webers, woks, pizza ovens and more. 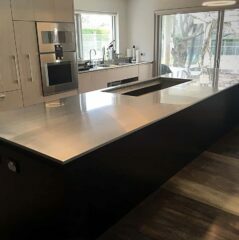 WE HAVE A FLAWLESS REPUTATION FOR PRODUCING HIGH QUALITY STAINLESS STEEL BENCHTOPS AND BENCHES FOR DOMESTIC AND COMMERCIAL USE. We are able to assist you with developing design ideas or work from supplied sketches or drawings, to fabricate exactly what you require. WE FABRICATE CUSTOM DESIGNED TABLES, TABLE FRAMES AND TROLLEYS, FOR BOTH DOMESTIC AND COMMERCIAL USE. We are able to manufacture any size and shape product, and our attention to detail ensures all products that leave our factory are at an exceptionally high standard. WE OFFER A RANGE OF STAINLESS STEEL BALUSTRADES FOR BOTH DOMESTIC AND COMMERCIAL USE. Each project is tailored for your personal or professional requirements, and we offer our expert opinions to enhance your design ideas. We also ensure that all aspects of your stainless steel balustrading conforms with Australian Government safety guidelines. STAINLESS STEEL IS IDEAL FOR BARS; VERSATILE, DURABLE AND HYGIENIC. Ackland Stainless Steel have designed and produced a range of mobile and fixed bars, big and small, for both domestic and commercial use. The scope of our work is diverse, and we are eager to help with your needs, so if you require cladding for columns, small boxes, kickers, flanges, bollards, or anything else! I am very happy with the bench top Andy! Thank you all for all the hard work that you have put in to make this project happen. Andy – thank you to your guys! Amazing job! It’s back on site already! I'm really, really happy with our beautiful bench tops – Andy and his team have done a beautiful job! A bit thank you to you all for getting this job over the line. Thank you for your flexibility, endurance, understanding and for going the extra mile to help out. I wish everyone had an understanding of exactly how much effort has been made to make this happen. Thank you for doing such a wonderful job making my teppanyaki cook top. It is exactly how I imagined it. It is great to see a company that gives such prompt quality service, with good old fashioned tradesman-like work. I have had several dealings with Andy from Ackland Stainless Steel. His work is of high quality, as is his service. Delivery of the projects were at an industry standard. Well Done! Thank you for making these amazing bench tops and sink. They are exactly how we imagined, and was one of the only parts of the house that worked perfectly, first time. 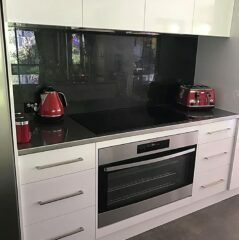 Thank you for ensuring our stainless steel benchtops and splashback was supplied and fitted to our bbq area before Christmas – your efforts are appreciated. Your flexibility and customer service in advising when you were about to attend our home for the install was greatly appreciated, it allowed me to lessen time away from my workplace. We have now used the rails that were installed yesterday and they work really well. It was a difficult make and we thought it might not turn out well but it is really good. Thanks to you and your staff, great build and an excellent installation. To discuss your stainless steel project with one of our experienced fabricators, please request a quote and we will contact you soon.